Gente di Mare Italian Genealogy › Community Forums › All Things Italian › Translations › Can this be translated for me? Community Forums › All Things Italian › Translations › Can this be translated for me? Can this be translated for me? Posted: Tue Nov 03, 2009 11:14 pm Post subject: Can this be translated for me? It's probably age but I am not able to read this record. I know the birth year, the parents and grandparents but cannot read the other info. Posted: Wed Nov 04, 2009 6:03 am Post subject: Re: Can this be translated for me? 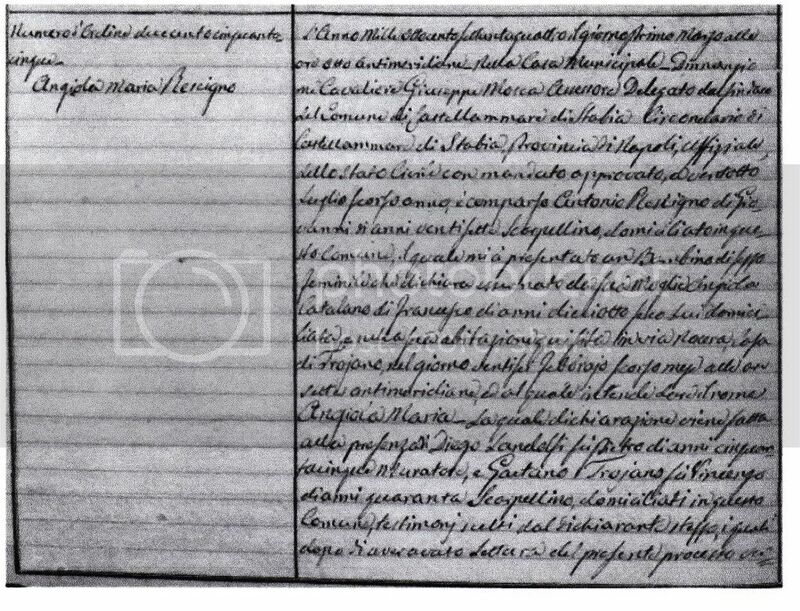 Angiola Maria Rescigno was born in Castellamare di Stabia to Antonio, 27, stone-cutter, son of Giovanni and to Angiola Catalano, 18, daughter of Francesco. Posted: Wed Nov 04, 2009 9:43 am Post subject: Re: Can this be translated for me? Thank you Livio. It seems strange they use the name Angiola rather than Angela in that area. It seems strange that they list Francesco's age as 18 or am I reading it wrong. It should be about 38. I had thought that Angela's parents were from the Naples area. Now I will check out Nocera Inferiore as a possibility. Francesco was also a stone cutter and later moved the family to Lercara Friddi Sicily. Wow! this is all getting interesting. I would never have found the birth record for Angiola as I was only looking for a brother-in-law who had married in Castellammare di Stabia. Was looking for his possible family and a death record. Surprises do happen. I found my whole family had moved from Roccapiemonte to Castellammare di Stabia. Posted: Wed Nov 04, 2009 9:53 am Post subject: Re: Can this be translated for me? Angiola and Angela are both valid names. Francesco' age is not reported. Angiola Catalano is 18. Via Nocera is the name of the street, in Castellamare di Stabia, where Angiola Maria was born. Posted: Wed Nov 04, 2009 10:04 am Post subject: Re: Can this be translated for me? Read your information again and realized that was the street they lived on at time of birth not the town. Duh! Posted: Wed Nov 04, 2009 10:09 am Post subject: Re: Can this be translated for me?